The latest version of NetBackup software, Veritas NetBackup (NBU) 7.7, was released by Veritas Technologies in early July 2015, and is designed to simplify data protection and manage relentless data center growth. Its major advances in cloud backup provide customers with new features and capabilities that make 7.7 unique from previous NetBackup products. 1. Expanded support for cloud storage providers, including Google Nearline, HDS, and Cloudian. Organizations can now easily add cloud storage as a backup solution within their environments. Veritas added a cloud connector based on Amazon Simple Storage Service (S3) that also works with Google Nearline, Hitachi Data Systems (HDS) public clouds, Cloudian and Verizon. NetBackup 7.7 also introduces breakthrough integration with VMware® vSphere Virtual Volumes, Microsoft® Hyper-V, NetApp clustered Data ONTAP® (cDOT), and Microsoft SQL Server™, and delivers enhanced self-service capabilities that allow both IT and non-IT users to independently manage and control backup and recovery activities using intuitive interfaces combined with native tools. 2. Enhanced cloud backup and restore performance. The new cloud connector introduced in NetBackup 7.7, designed on Amazon Simple Storage Service (Amazon S3), is optimized to significantly improve backup and restore times for Amazon S3-compatible cloud storage targets. The new connector takes advantage of multi-streaming and other techniques to fully utilize network bandwidth, significantly reducing backup and recovery times when compared to previous releases. In addition, NetBackup 7.7 supports cloud gateways from NetApp and AWS using a tiered approach to replicate backup data to cloud storage. NetBackup’s Auto Image Replication (AIR) feature now enables businesses to efficiently replicate catalog and backup data in a cloud environment, while efficiently preserving the de-duplicated state of backups. New Intelligent Policies for Microsoft Hyper-V and Microsoft SQL Server help enterprise IT organizations scale faster, increase flexibility, and provide the appropriate controls to the right people. The new NetBackup 7.7 provides single solution for your enterprise, available on a converged platform, and requires minimal administration even in the largest, most dynamic environments. 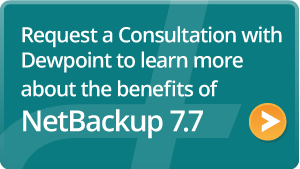 To learn more about Veritas NetBackup 7.7, and its other great capabilities, request a consultation with Dewpoint.